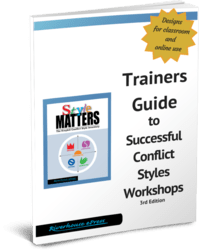 40 page step-by-step guide to leading a conflict styles workshop, from start to finish. It's FREE! This is a French version of our 2014 Trainers Guide. The English version was updated in 2017 but this 2014 French version age guide still provides the basics for leading a conflict styles workshop. Includes training exercises, suggestions for opening and closing, a section on culture and conflict, discussion questions, and a roleplay. The guide is keyed to our Style Matters inventory, but most of the content applies to any inventory based on the Mouton Blake Grid, including the Thomas Kilmann. It's quick and easy to download - email and password only required - and we will never give your info to anyone else.